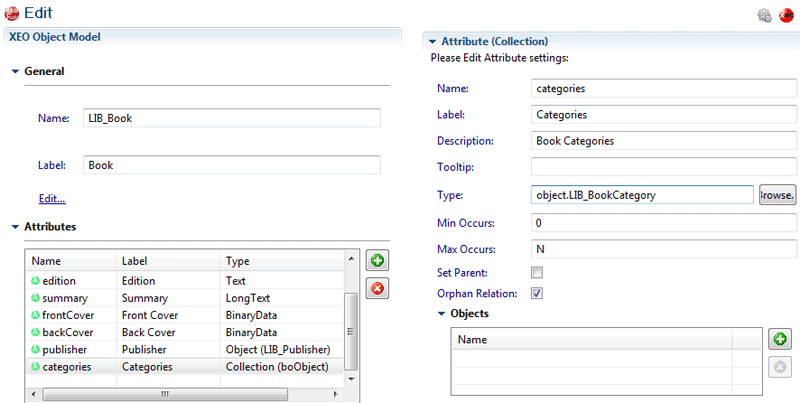 In the last section, you've seen how to use XEO Studio to create the XEO Model for the Author entity (named LIB_Author). Now you'll start by progressively creating the XEO Models for the other entities. To make things easier to explain and also to show XEO's ability to deal with change over time you'll first create some Object Models that do not contain all of their attributes and, as the explanation progresses, add the remaining attributes later on. 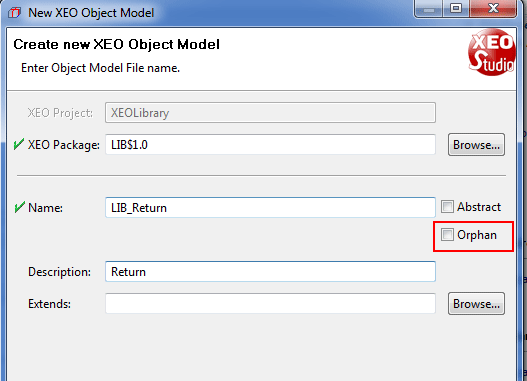 To create the LIB_BookCategory XEO Model, go to the "File" menu, select "New" and then "XEO Object Model". In the XEO Package field, find the "LIB$1.0" package and in the name type "LIB_BookCategory", in the description you can write "Represents a book category". Press finish and add a "Text" attribute and fill the name field with "name", label with "Name" , description with "Name of the category", length with 30 and in the "Required" section, choose "BOL" from the dropdown menu and type "true" in the field that appears. Your XEO Model should look like the one depicted in figure ME.1 and ME.1a. Save both XEO Models and by now you'll have four XEO Object Models (LIB_Author, LIB_BookCategory, LIB_Publisher and LIB_Book). If you recall from the introduction, the Book entity had a 1:N relation with authors and categories and a 1:1 relation with publishers. You'll now add those relations to the LIB_Book Object Model. You'll begin with the 1:1 relation with publishers. Open the LIB_Book Object Model and add another attribute of type "Object". For the attribute name use "publisher", for the label type "Publisher" and in the description type "Book Publisher". You'll notice that "Object" attributes have a different set of properties from previous attributes created, one of them being the "Type" (highlighted in red in figure ME.2). The type property defines which type of instances (i.e. instances of which XEO Model) can relate to instances of the current XEO Model; in this situation you want that LIB_Book instances have a relation with LIB_Publisher instances so you'll have to select the LIB_Publisher object model. The default value for the Type property of an Object attribute is object.boObject. boObject is the super class for all Object Model instances (similar to Object in Java) and you can use it as representation of "any Object Model". The object.XEOModelName is the syntax used internally but by pressing the "Browse" button (see figure ME.2) you only need to choose from the list of XEO Models in your project (Typing XEO Model names will narrow the list progressively). Choose "LIB_Publisher" as the type for the publisher attribute. Note: Object attributes can have several more properties which will be discussed later in the documentation (for example, it's possible to declare the following: instances "LIB_Book" have a 1:1 relation, through attribute X, with an instance of Model A, Model B or Model C, instead of just one possible target). This is the state of the LIB_Book Object Model after adding the Object Attribute. To finalize the LIB_Book Object Model you'll need to add the 1:N relations (with Categories and Authors) which will be done in the following section. Collection attributes in XEO Models represent 1:N relations, which are among the most common in XEO Object Modeling. To create a Collection attribute it's required to specify not only the target Object Model(s) but also the cardinality of the relation (minimum an maximum), as usual there are several other options which will be explored later. 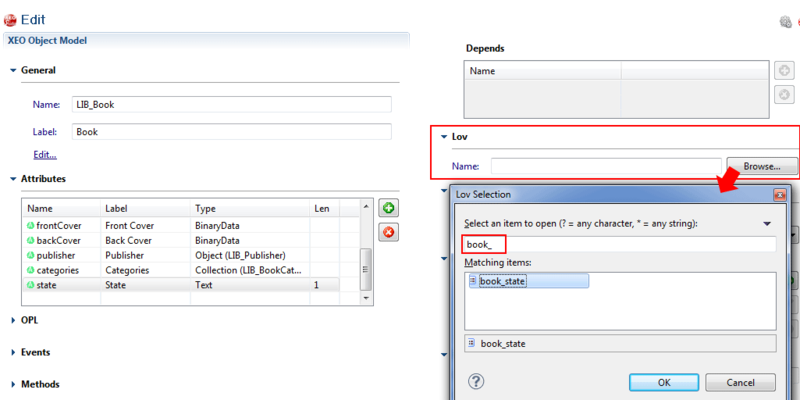 Check figure ME.3 to see how to create the collection attribute for the "Book Categories" relations. Notice the state attribute, which represents the state of the book (whether it's in the library or with some library user). The state is an attribute which can have two values (available/unavailable) and instead of using the value 0/1 or true/false in a Number/Boolean attribute and having to make the conversion each time you want to display the value (i.e. to show the string "Available" or "Unavailable) you'll use a XEO Lov (List of Values) which allows you to map keys to values (and you'll map "0" to "Unavailable" and "1" to Available) and integrates directly with the XEO Model, see the next section on how to create a XEO Lov. A XEO Lov is a file with the .xeolov extension and it's basically a container for lists of values (i.e. one .xeolov file can have multiple lists of values). Alternatively XEO Model attributes can define their own List of Values, but that list cannot be reused by another attribute (nor in another XEO Model). To create a new XEO Lov file, go the "File" menu, choose "New" -> "XEO Lov", choose the "LIB$1.0" package type the name "LIB_Lov" and press finish. When a new XEO Lov file is created, a single list of values is created by the name of "lov1" with two items (label1/value1 and label2/value2), use the buttons in the details panel (on the right, in figure ME.3a) to edit the values so that they match the following screen (figure ME.3b) and save the XEO Lov. Figure ME.3b - XEO Lov editor with the State Lov values. To finalize the LIB_Book entity the state attribute, must be linked to the "book_state" lov in the LIB_LOV.xeolov file. Open the LIB_Book XEO Model and select the state attribute and scroll down to the "Lov" section in the attribute's details panel. Press the "Browse" button and start typing "book_" in the text field to narrow the choice of lovs, select the "book_state" lov and press ok (see figure ME.3c for details). Figure ME.3c - Choosing a lov item for the values of the state attribute in the LIB_Book XEO Model. Save the XEO Model to finalize the changes and proceed to the next section to create the remaining XEO Object Models. In this chapter you'll model the entities that deal with users and their interaction with books. (Librarians and Users, Movements and Returns and finally the Messages librarians can send each other). XEO provides a set of XEO Models that help dealing with users, so the best way is always to reuse one of those. One the XEO Models is the iXEOUser interface which declares a set of attributes (name, username, password, id, e-mail) necessary for user accounts. Librarians and Users will require these attributes and add another attribute which is the library identifier (for users) and library employee identifier (for librarians). The librarian also has a 1:N relation with the messages entity. It's also possible to override an attribute definition inherited from an implemented interface. This is usually done usually to add custom behavior to that attribute (which may not be present in the interface). 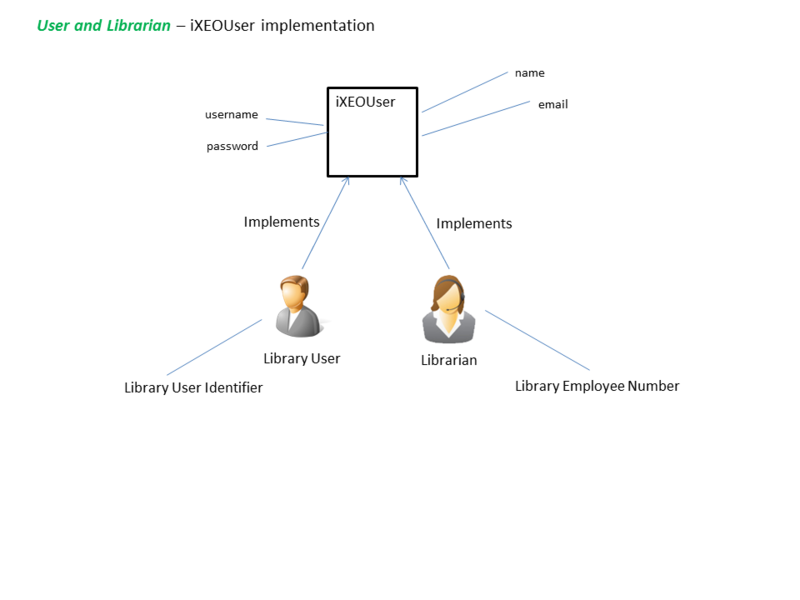 In the XEO Library application you'll override the e-mail and username attribute in both Librarians and Library Users to add custom behavior later on. Now, you must set both the Object Models to implement the iXEOUser interface. Doing so, requires to open each Object Model, find the "General" section and press the "Edit..." button which will open the general properties in the details panel; find the "Implemented Interfaces" section and press the add button. The result is depicted in figure ME.5. Next, you'll create the Movement entity (representing a Library User taking some books home, from the library). Create the LIB_Movement Object Model in the LIB$1.0 package as usual) with the following attributes. *Create a Lov in LIB_Lov.xeolov named "movement_state" with two items (label/value): "Open" / "0" and "Closed" / "1". Instances of the Return entity only make sense if there's an instance of the Movement entity to associate them with (you can't return books you haven't taken). Recall from the XEO Concepts that XEO can declare Object Models which can only exist as children of other Object Models, those were referred to as Orphan and Non-Orphan Object Models. In the case of the return entity it's an example of a non-orphan entity (i.e. it cannot exist as an "orphan", it must have a parent), as such, when creating the Return entity we need to uncheck the "Orphan" box in the XEO Studio Wizard (as depicted in figure ME.5a, highlighted in red). * - As explained before, boObject is the generic object type in XEO, which means that using boObject in the type of a collection attribute allows you to relate with any instance of any Object Model. In this situation, however, we only want to allow a message to be delivered to a specific librarian, or to a group of librarians, as such the definition of the recipients attribute should allow to relate to instances of the LIB_Librarian Model or with groups of Librarians. One of XEO's built-in Object Models is the Ebo_Group which represents a group of users in the application and you'll use that for the recipients attribute. When creating the recipients attribute, choose as type "boObject" and scroll down to the "Objects" section and press the "add" button to add the LIB_Librarian and Ebo_Group Models to the definition, this will restrict the type of instances for the relation. See figure ME.6 for details. Figure ME.6 - Collection attribute with restrictions to the type of target Object Models. To finalize the entity modeling, the only remaining entities are the Contact and Publisher Nucleus, which you'll create in the next section. Save all open XEO Models and you've finalized the initial modeling of the XEO Library entities. Jump to the next chapter to know how to add behavior to the XEO Models.